Scythe announces its newest high-end CPU cooler, named “Yasya” to the market. Yasya CPU Cooler is the first cooler from Scythe equipped with the newly developed T.M.L.F. (Trident Multi Layer Fin) structure. This special design maximizes the cooling surface to provide the best cooling result of the heatsink. By placing the heatsink fins as well as total of 6 copper heatpipes in unparallel design, static pressure loss is minimized and heat transfer is maximized. 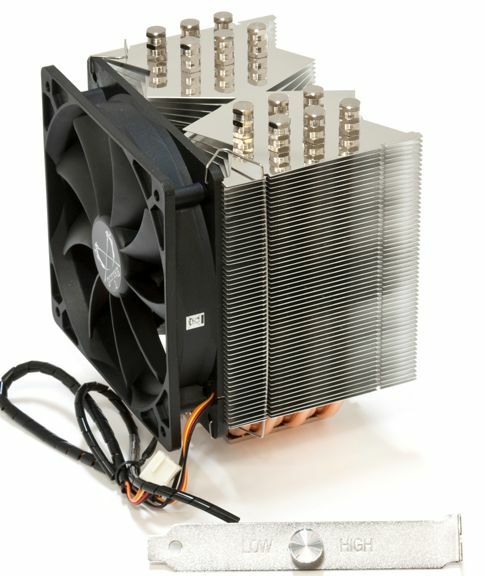 New 120 mm "Slip Stream 120 Adjustable PWM" case fan is supplied for optimized airflow. Although the fan supports the PWM feature user can manually adjust the bandwidth between 470 to 1,370 rpm and 740 to 1,900 rpm. Easy mounting is available by the famous V.T.M.S. (Versatile Tool-Free Multiplatform System) which requires no motherboard removal for the heatsink mounting. Yasya CPU Cooler is compatible to all current sockets, including the new socket LGA 1156.